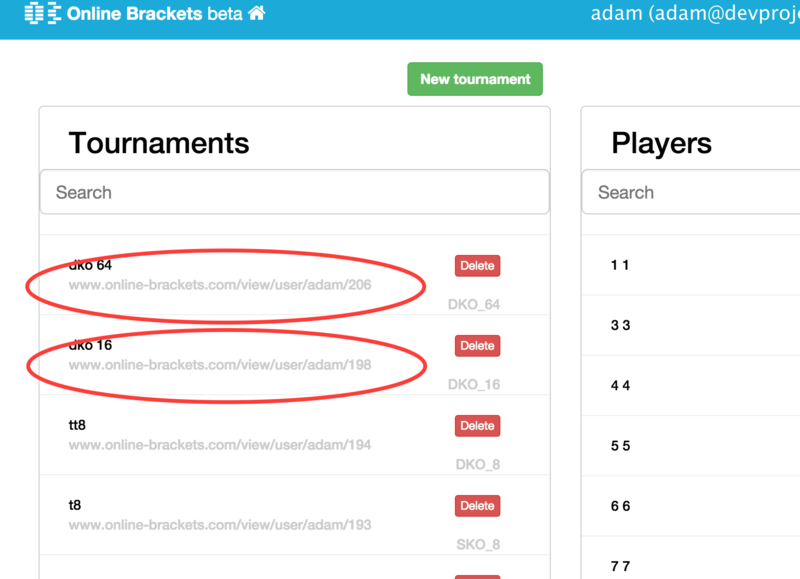 Online-brackets is an online system that allows you to run various tournaments online. Starting with small single knockout up to large double knockout or round robin. Follow the instructions to create a new one. Once logged-in, user is presented with current tournaments on the left and players on the right. Click 'New Tournament' or 'New player' buttons to get started. Click on player name to edit the player. There are many ways of managing players. Players can be added/modified/deleted on main page after logging-in.Main page may also be accessed by clicking home button from top bar. 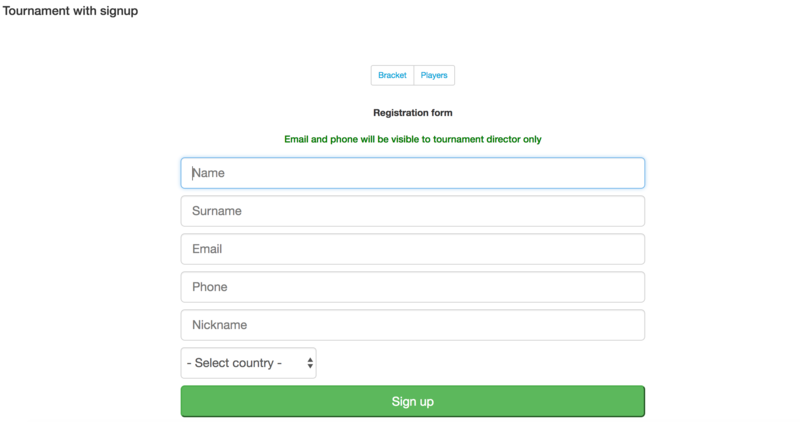 If tournament is already in progress, players can also be added by clicking 'Lateregistration' button. In case of round robin format, given group will be regenerated. 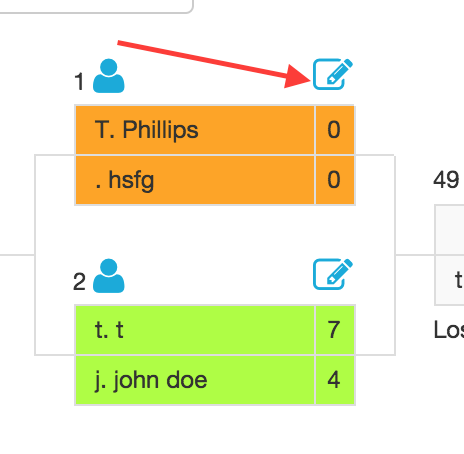 For normal brackets, after adding player to the tournament it can be placed in proper place on bracket byclicking little personicon above the match and selecting from list. After clicking 'New tournament' on main page, user is presented with general info screen. Enter name, optional date and location and select format. 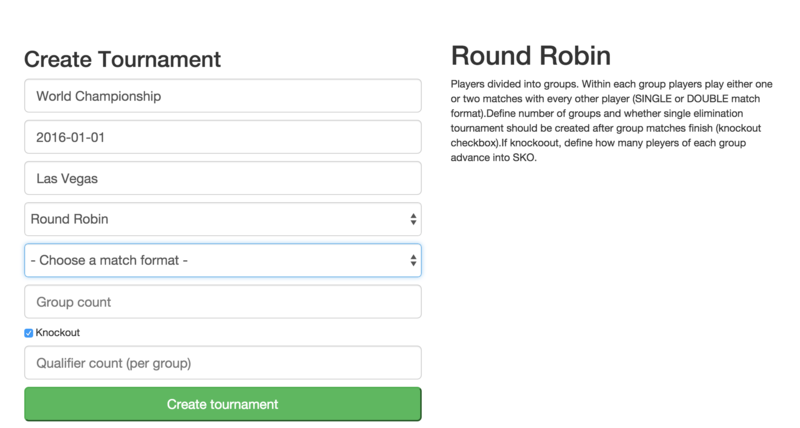 Knockout (optional) - if selected, user must specify how many players from EACH groupwill qualifyto single knockout. 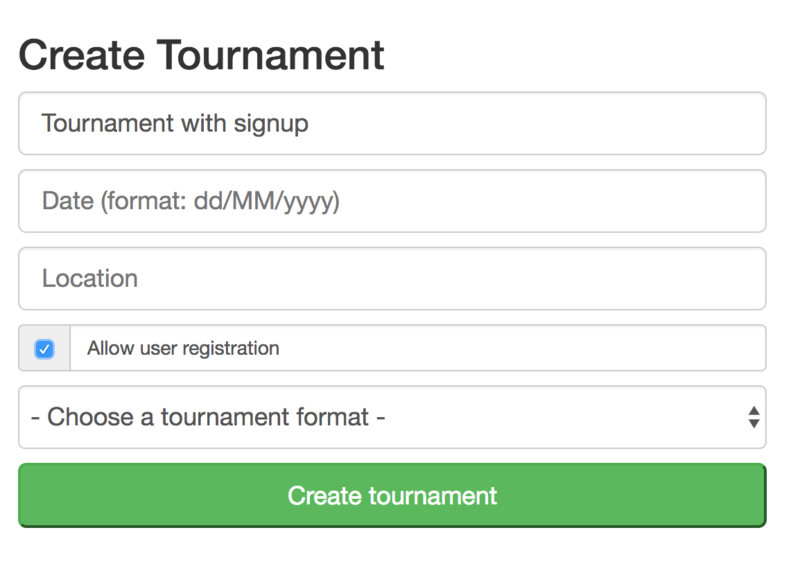 After pressing 'Create tournament' button user is presented with manage tournament page. To manage seeding, select players in the middle column and press right arrow next to it. How to change tournament information ? 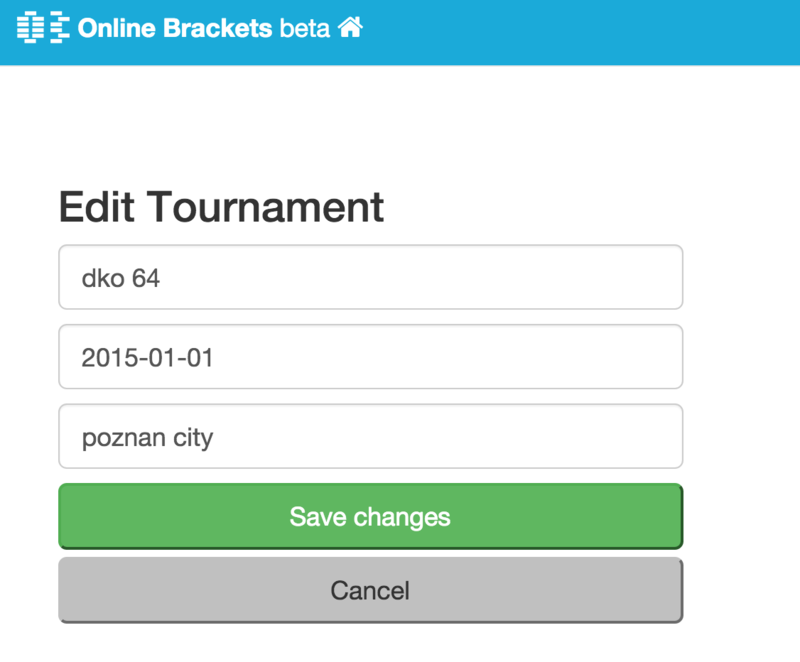 Once tournament is created you can always change basic information (date, location, name) bypressing 'Edit tournament info' and change data on next page. How to manage match (score, status) ? How does automatic draw and seeding work? Winner of group 1 will be seeded with number 1. Winner of group 2 will be seeded with number 2. Winner of group n will be seeded with number n.
If 2 players from each group qualify, the system will mare sure that each playerranked 1 in a group willplay with random player ranked 2 from any other group. For more players, system will behave in same way. In case of Double Knockout tournament, when all LQ and WQ players have completed theirmatchessystem will automatically perform the knockout draw. It will make sure that 2players that played in same WQ match will not meet againin first knockout round. Player with seeding number 1 is placed as first player in group 1. Player with seeding number 2 is placed as first player in group 2. This mechanism continues until all groups are filled with 1st players. Next seeded players will be places as 2nd players in each group, then 3rd and soon. When all seeded players are places in groups, the rest of players is selectedrandomly. Player with seeding number 1 is placed at the top of the table. Player with seeding number 2 placed in the very bottom. Player with seeding number 3 is placed at the top of middle part and so on according to standard rules. Not seeded players are placed randomly. How to manage combined tournament rankings ? 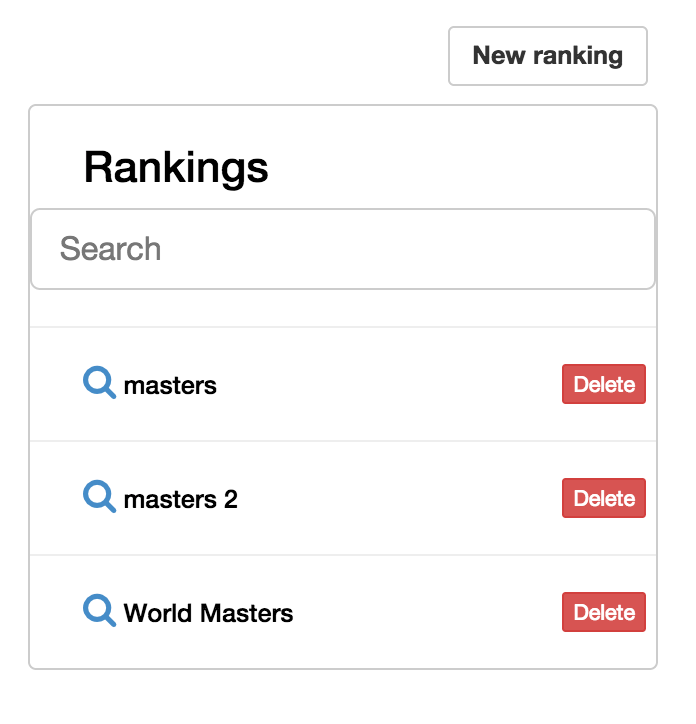 It will make create ranking window appear at the top of the screen. After entering the name and submitting it will appear on the list below. View the ranking by clicking the magnifying glass next to it. How to manage Logos ? 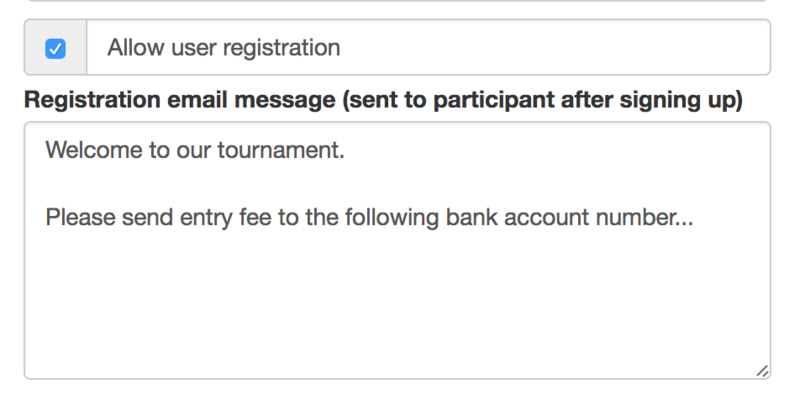 How to allow tournament signup ? 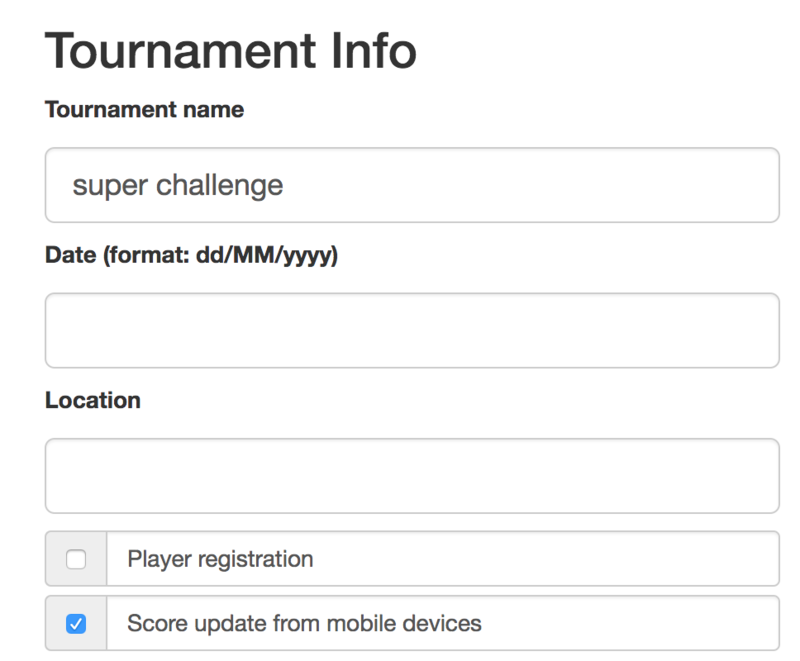 Once the tournament is created go to 'tournament info' section to specify the message that can be send when user signs up. When you share the public url for your tournament (e.g. www.online-brackets.com/view//1) viewers will see a 'signup' button. Clicking this button will show them signup form. As the tournament manager, you can use new 'Participants' button. This leads to parcicipant management screen. Here you are presented with all pending confirmation and confirmed players. After clicking the 'confirm button' a new window appears with confirmation options. Select already existing player if you have one with same name already defined.When using this option you can choose to copy email and phone from registration data toexisting player. How to manage venues ? Create, edit or delete venue information. Go to tournament info edit page and select required venue from available list. How to allow score update by players (phones/tablets/laptops) ? Right now available for brackets only, round robin coming soon. To restrict access to only people you want to update given match, each match has a PIN code assigned. 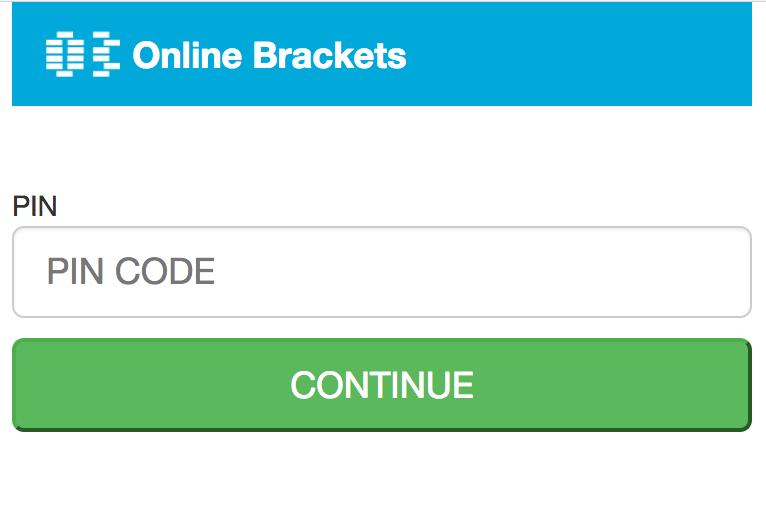 All codes are generated when tournament is created. In order to change the codes, go to 'Mobile PIN codes' section to update each code manually or click'Generate codes for all matches' to assign random PIN codes for all the matches. You can always check the PIN code on match update screen. Players can update the scores by clicking 'Mobile score update' button. After selecting the match they are aked for the PIN code. 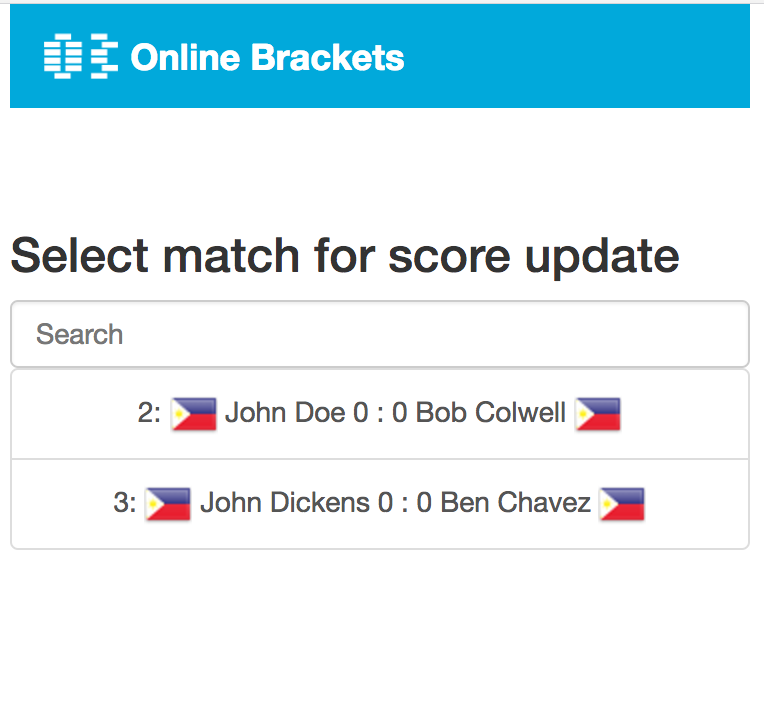 When correct PIN code is provided, users can use +/- buttons to change the score or finish the match.